Our story begins with the story of Saint Francis and Saint Clare. It is impossible to tell the story of one without the other, for in the Providence of God these two are inseparably intertwined. The tiny seed sown in thirteenth century Assisi rooted itself firmly in the Church and thrust our vigorous shoots to become the great tree of the Franciscan family, spread far and wide through time and space, flourishing still at the end of twentieth century. It was a seed of divine origin – Francis is quite clear: “And after the Lord gave me brothers, no one showed me what I should do, but the Most High Himself revealed to me that I should live according to the form of the Holy Gospel”. (Testament of St. Francis). And Clare, who loved to refer to herself as “the little plant of the blessed Father Francis”, writes in her Testament. “The Lord gave us our most Blessed Father Francis as founder, planter and helper in the service of Christ and in those things we have promised to God and himself”. Who were these two saints who have influenced so greatly the life of the Church and the history of Christian spirituality through the ages? They grew up in the same Italian town of Assisi towards the end of the twelfth century – Francis, the son of Bernardone, a rich cloth merchant, and Clare, eldest daughter of the noble and wealthy Offreduccio family. Clare was ten or eleven years younger than Francis, and because the merchant class was fighting against the nobles, neither of them would have known each other in their early years. When Francis grew to young manhood he went off to war against neighbouring Perugia, hoping to win knightly glory but the Lord made him realize that he was calling him to His service instead. So Francis returned to Assisi to spend some years in searching, struggle and indecision before he finally became aware of God’s to preach the Gospel of peace and forgiveness to all. He gave up everything, dressed in a poor garment and barefooted walked the streets and countryside, speaking in simple and glowing words the message of the Gospel that burned within him. Soon he was joined by other men from all walks of life. They worked with the local labourers for the food they ate and when that was not enough they begged their bread from door to door. At first, people thought them mad, then they began to admire them when they saw how they reacted to derision and mockery, really living the message of the Gospel and giving away all their worldly goods to the poor, and finally, Francis was regarded as a saint, the founder of a new religious family in the Church, and his followers were respected and loved by all. Clare, meanwhile, had grown into a beautiful young girl, not only in outward appearance but also in true spiritual goodness, deeply prayerful and concerned about the plight of the poor in her native town, with whom she frequently shared her own rich food. At. Eighteen, she was being urged by her parents to enter into a suitable marriage: but having heard Francis preach in the Cathedral she realised that she, too, was being called by God to a life of poverty and prayer. 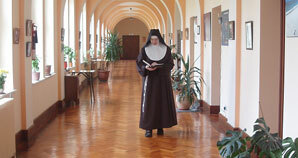 Accompanied by a trusted relative, Clare spoke to Francis in secret about her vocation several times. She realised that her family would never agree to her joining this new Order so totally removed from the society in which she had been brought up. So on the night following Palm Sunday 1212 she left her father’s house with her companion and was received by Francis and his friars in the little chapel of Our Lady of the Angels in the woods.